Once-upon-a-time, Ford had a sophisticated lightweight aluminum-intensive rear wheel drive platform code-named DEW-98. 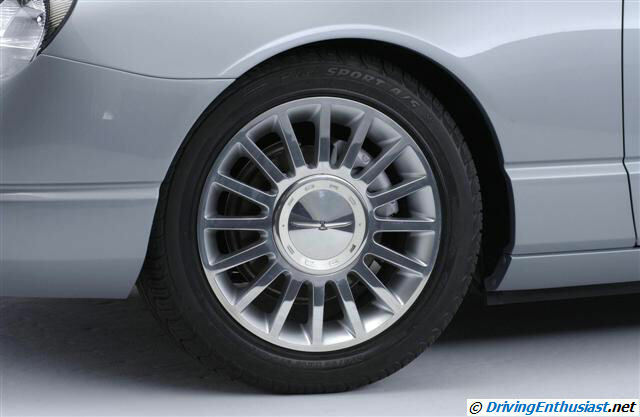 It was the basis for the Jaguar S-Type, Lincoln LS, and Ford Thunderbird. And it was also intended to be the basis for a new and very modern Mustang, although Ford was afraid that it would be too expensive for a lowly Mustang that had to have an entry price of $20k (instead, all we got in the end was the floorpan, gas tank, and hard points when it was dumbed down as the S197 – minus the SLA front suspension and the independent rear suspension). And then little Billy Ford, who thought he could run a corporation, went off on a jihad to kill off anything and everything that Jacques Nasser had put in place – such as this advanced platform, a smaller rear wheel drive version for Lincoln (exactly what Cadillac has done now), a move to European Ford platforms for small cars, and lots more. We can only wonder where Ford would be now without the dark years that the ascendancy of little Billy Ford produced. 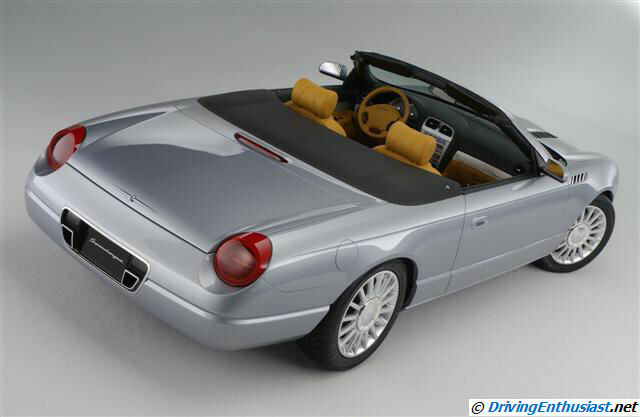 The DEW-98 platform beat Nissan’s similar FM platform (Infiniti G, M, and FX and Nissan Z) to market and the intention for its use was similarly flexible (where the luxury brands using it would keep costs down for the Mustang). With unequal-length control arms front and rear, great geometry, and heavy use of aluminum to keep weight down, the DEW-98 was planned to be the platform of the future. If only Ford had stayed the course – we’d have an answer for the desperately needed new Mustang platform in 2014, a new Ford of Australia Falcon, and even (in the planned upsized form) a new Lincoln Continental and Mark X. Contrast this to the unsophisticated and heavy Volvo retreads underpinning the large Ford and Lincoln offerings today. The Thunderbird was the sexiest use of this platform. When it was announced, all sorts of options were planned for driving enthusiasts – that is, more mature driving enthusiasts than most Ford buyers. Planned were a Brembo brakes and handling package (referred to in the Car and Driver launch article), a 6-speed manual behind the V-8, a V-6 option for entry-level, and this car – a supercharged V-8 model. Several prototypes were built… it’s thought that Mr. Nasser still has the one today that he took with him as his going-away gift to himself. The car below is a concept of the intended supercharged model. 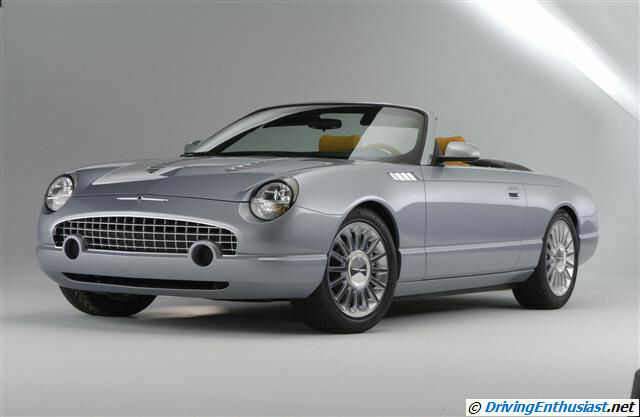 It probably wouldn’t have appeared until approximately 2006, when updates were planned including a new Thunderbird-exclusive dashboard (announced in an interview with Mr. Nasser). The concept was never road-tested or even driven by car magazines, so we don’t know it’s performance. You could compare it to the similarly engineered although considerably heavier Jaguar S-Type R.
The base V-8 engine design was developed with Jaguar, with very slightly different specs in the Thunderbird (cylinder liners, for one example) and Lincoln LS in order to preserve the image of Jaguar exclusivity (despite the reality). 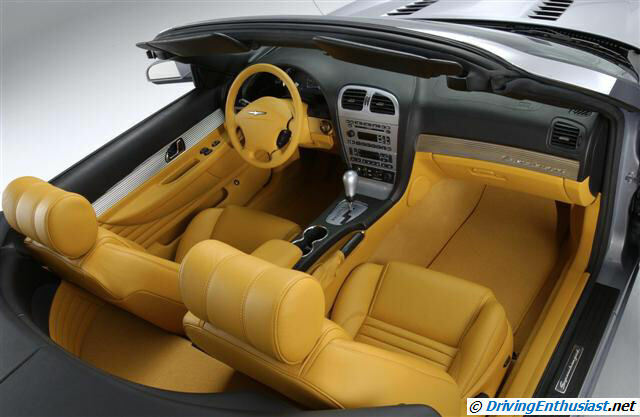 It was also shared with Aston Martin (topped with a higher flow intake and unique tuning) and is in use to this day. Now imagine this engine with EcoBoost trimmings, or even replaced by the EcoBoost twin-turbo 3.5l V-6. An off-the-OEM-shelf Getrag 8-speed automatic transmission would be the perfect pairing (and already engineered by Jaguar). We’d guess that the showcar hood and center-exit exhaust would be dropped before production. One of the concepts built was auctioned off on August 12, 2010. We can only hope that its new owner will allow an instrumented test some day, or at least a driving impression. We’d volunteer to fly wherever needed with no notice…! 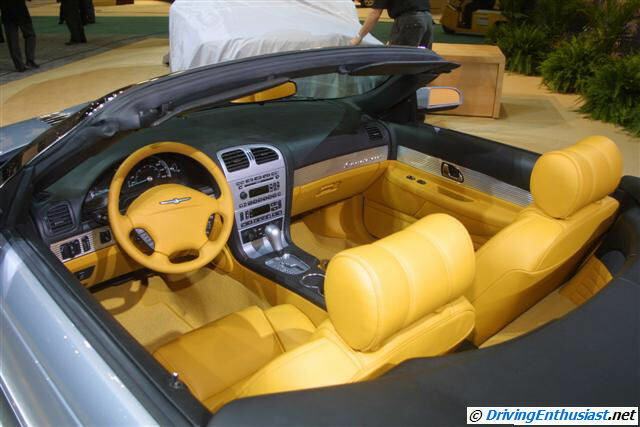 Jan. 2, 2003 Ford Motor Company today introduced a Supercharged Thunderbird concept car as a possible future addition to its Living Legends line of automobiles. 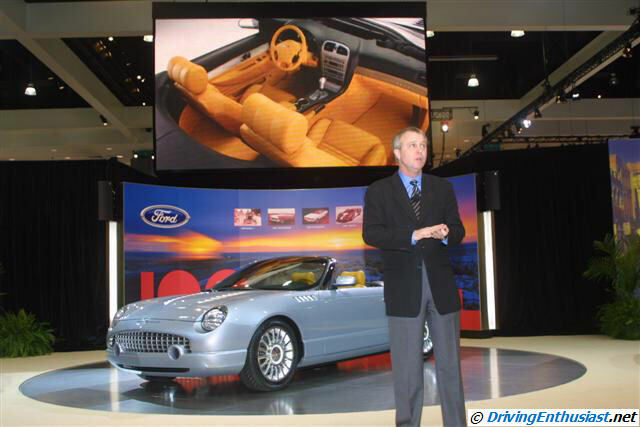 The 2003 Los Angeles Auto Show debut signals the influence of the newly established Ford Performance Group (FPG). 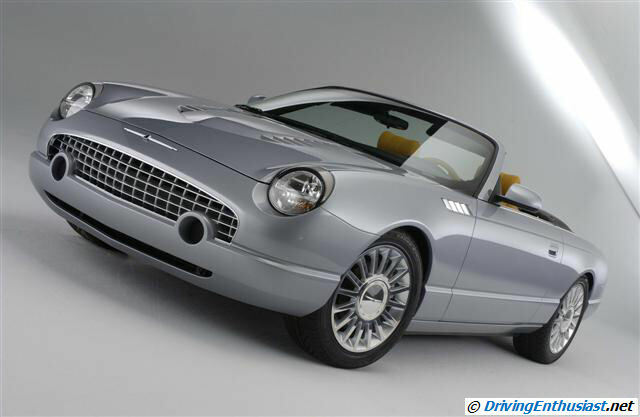 The supercharged Ford Thunderbird concept is powered by a 3.9-liter 390 horsepower supercharged V-8 engine. 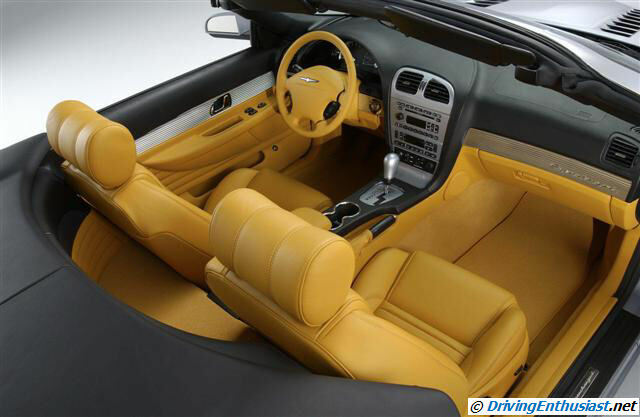 It was designed to gauge consumer interest in a performance-tuned version of Ford’s iconic two-seat sports roadster. 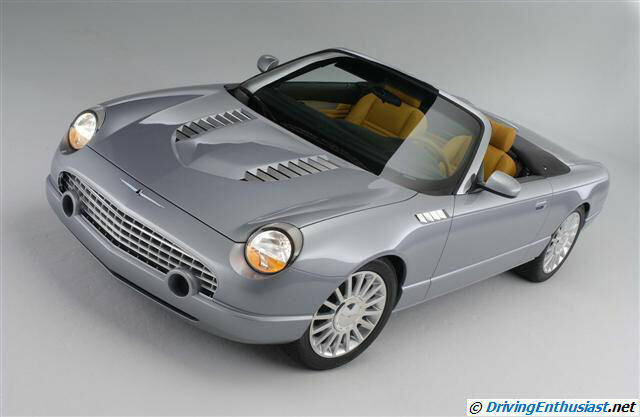 The Supercharged Thunderbird concept was a joint development of Ford’s Living Legends Design Studio and the FPG as a potential addition to FPG’s future product portfolio. The Supercharged Ford Thunderbird concept combines America’s ultimate dream car with an enthusiast’s ultimate dream engine under the hood, says Mike Zevalkink, Ford Motor Company executive director, Ford Performance Group. Thunderbird offered us an excellent basis to leverage product excitement even further with our performance expertise. Ford’s supercharged Thunderbird concept is joined on the company’s 2003 LA Auto Show display by two other customized Thunderbird cars. 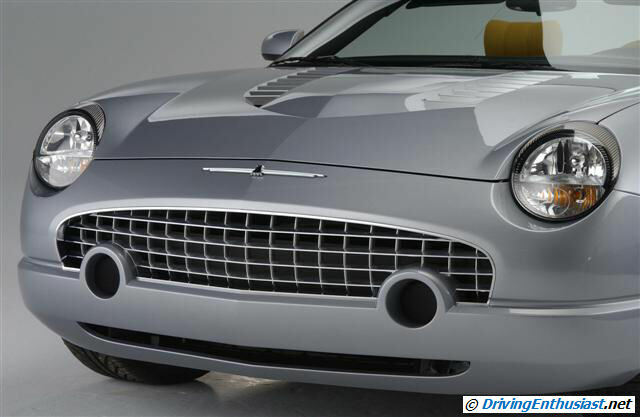 The Thunderbird Chip Foose edition, first shown at the 2002 SEMA Show, features a cut-down speedster windscreen, custom interior and other major restyling modifications. The Thunderbird Roy Brizio edition, also shown at the 2002 SEMA Show, includes unique front, side and rear styling enhancements in a dark green metallic paint color. With 390 horsepower on tap, the Ford Thunderbird 3.9-liter supercharged V-8 engine transforms the vehicle’s character from a grand touring car into a performance-minded sports roadster. The supercharger setup offers peak horsepower at 6,000 rpm and 390 foot pounds of peak torque at 3,500 rpm, giving the Thunderbird concept car impressive power and acceleration capabilities. 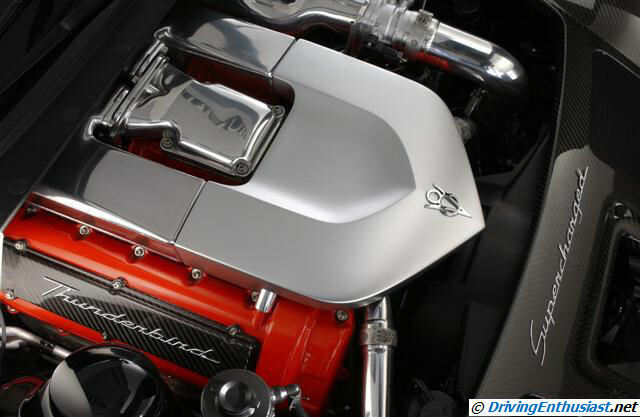 Ford’s powertrain engineers began the supercharged concept’s transformation with a stock 3.9-liter DOHC modular V-8 engine from the standard Thunderbird. 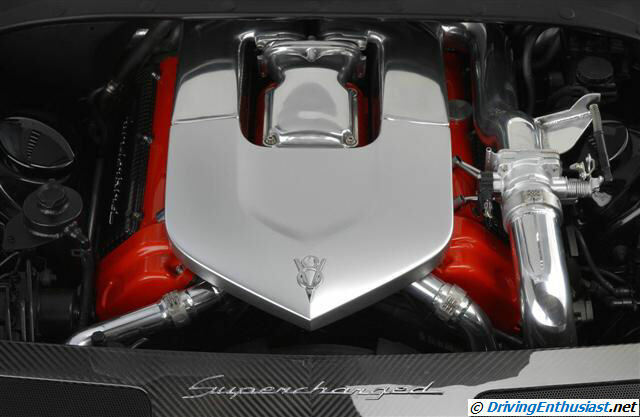 Then, all-new aluminum headers were fitted along with a Roots type supercharger to provide the necessary thrust. Achieving 390 horsepower from a relatively modest 3.9 liters is a testament to this engine’s efficient use of technology, says Dave Szczupak, Ford Motor Company vice president, Powertrain Operations. The raw power of this most powerful Thunderbird ever is intoxicating to sample, but our designers have made the Supercharged Ford Thunderbird just as exciting visually as it is to drive. 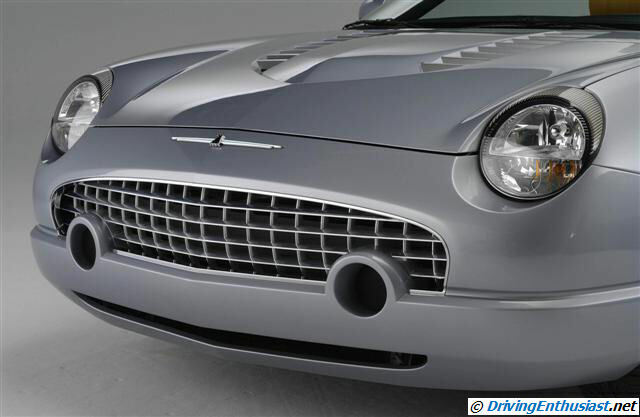 The design team, working in concert with the FPG, gave the supercharged Thunderbird concept an equally appealing underhood appearance to match its powerful exterior design. Details like a polished high-flow intake pipe and Gloss Red cam covers with carbon fiber coil covers accentuate the engine design. The â€˜Thunderbird’ script is inscribed across the cam covers. A carbon fiber radiator cover housing integral supercharger air filters completes the display. The production Thunderbird is bold, confident and free, with classic design cues translated into a contemporary design language. 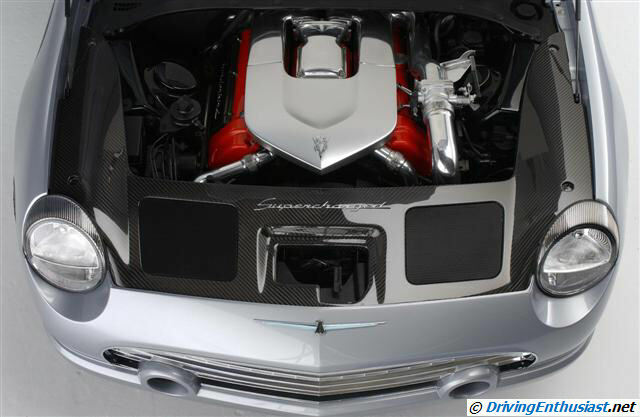 The Supercharged Thunderbird concept design is more aggressive, refined and powerful, entirely in concert with the powerplant under its hood. Designers at the Ford Living Legends design studio massaged nearly every body panel on the concept vehicle to provide just the right visual presence for Ford’s most powerful Thunderbird ever. The hood, front fenders and front and rear bumpers are unique, as are the seat and trim materials in the interior. 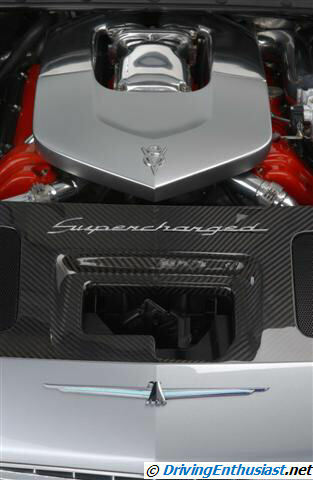 An all-new power dome hood provides visual differentiation and functional engine cooling for the supercharged engine. 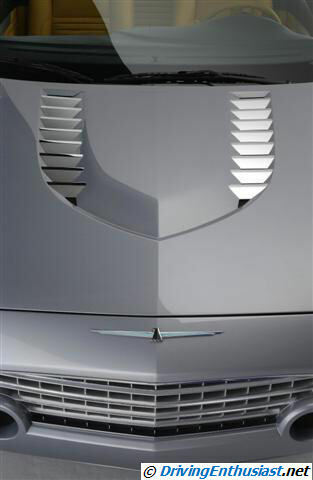 Chrome was liberally applied to the 16 forward-facing surfaces on the hood’s twin air extractors, with the engine’s Gloss Red cam covers visible through slots in the louvers. 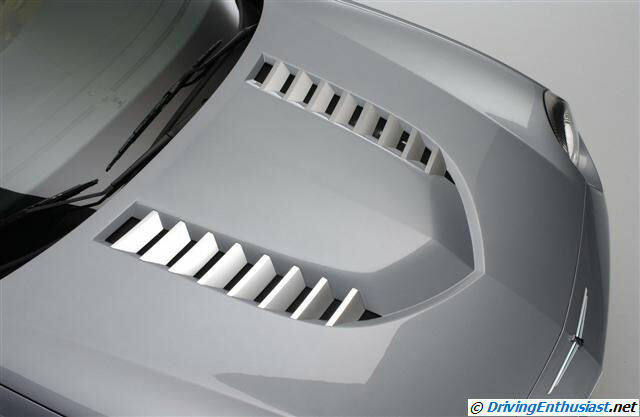 A new, more prominent grille is finished in the same chrome as the hood’s twin air extractor louvers. 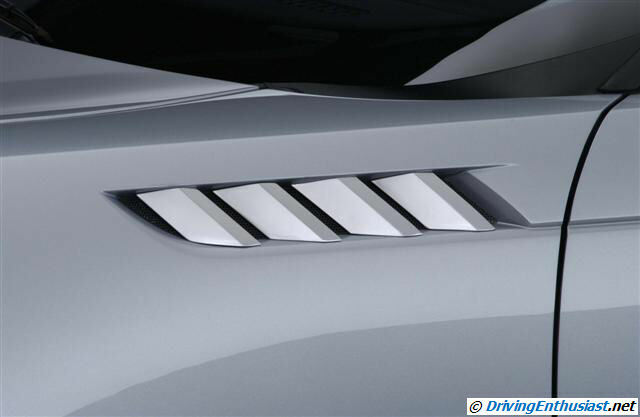 Air intakes have been placed in the grille openings used for driving lights on the production Thunderbird. Chromed air intakes also grace each front fender, but are larger in size than the production vehicle, with all-new, cut-down rear view mirrors in color-keyed housings. Reworked front and rear bumpers complement the one-inch lower suspension, while 18-inch tires on custom, 16-spoke aluminum wheels anchor the vehicle to the road, both visually and functionally. A lockable, two-piece hard tonneau cover conceals the soft, black convertible top underneath. 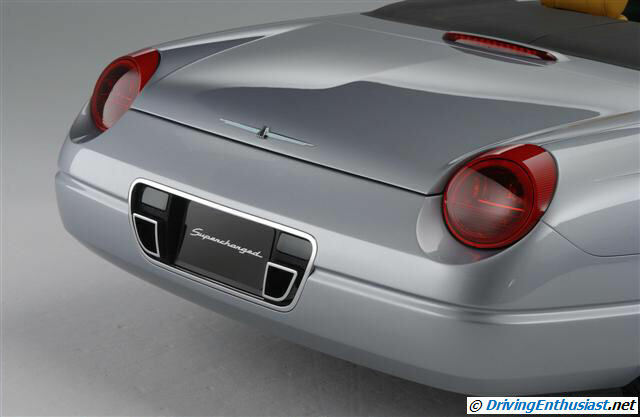 At the rear, twin exhaust ports exit on either side of the license plate surround, seamlessly integrated into the rear bumper. Rear backup lamps have been moved from the taillights and now reside directly above the exhausts, inset into the license plate housing. The exterior, painted cool Machine Silver, complements the Supercharged Thunderbird concept’s all-leather, chamois-tinted interior. 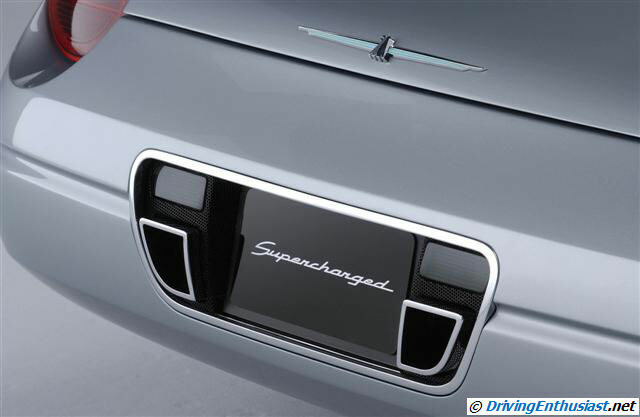 The Supercharged Thunderbird concept also features generous use of polished and brushed chrome on horizontal ribs surrounding the interior, while the center stack is adorned with Machine Silver inserts. Ford Motor Company (NYSE: F) is the world’s second largest automaker, with approximately 335,000 employees in 200 markets on six continents. 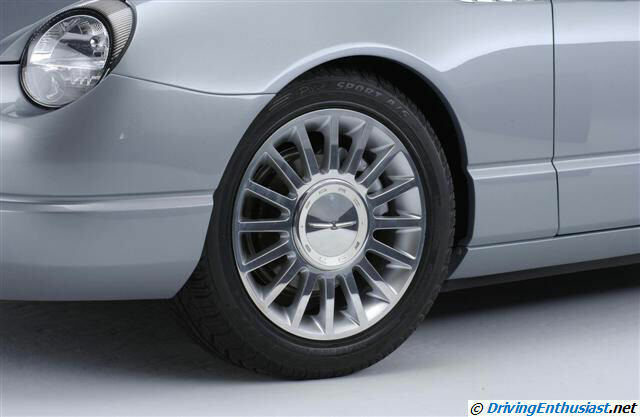 Its automotive brands include Aston Martin, Ford, Jaguar, Land Rover, Lincoln, Mazda, Mercury and Volvo. Its automotive-related services include Ford Credit, Hertz and Quality Care. The company’s world headquarters are in Dearborn, Mich. Ford Motor Company will officially observe its 100th anniversary on June 16, 2003. Additional information can be found on the company’s web site at ford.com.